Check out the top Staples Center events 2017! As always the Los Angeles Staples Center will host some of the biggest games of the NBA Season as well as the hottest concerts in Los Angeles. One of the hottest Staples Center events 2017 will be the NHL All-Star Game not to mention the entire All-Star Weekend. The All-Star game, NHL All-Star Skills Competition also NHL Fan Fair take place January 28th & 29th, 2017. Score your NHL All-Star game tickets today. The Los Angeles Lakers are back with a new head coach in addition to the first round pick Brandon Ingram. Don’t miss the World Champion Cleveland Cavaliers on March 19, 2017. 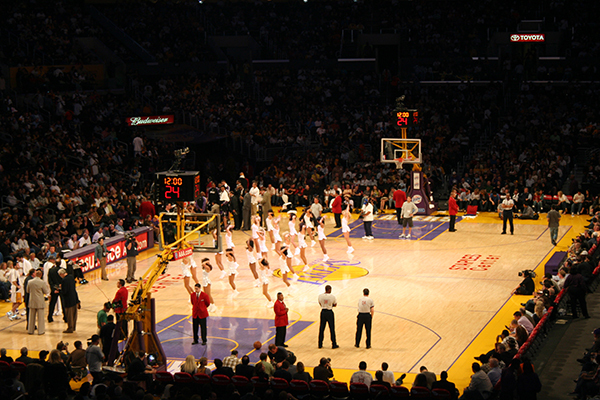 Get Los Angeles Lakers Tickets today. NFL Football in Los Angeles – Deja Vu all over again or something better? From 1946 to 1980, the Los Angeles Rams roamed LA’s Colleseum with players like Rosey Grier, Merlin Olsen, and Deacon Jones stalking opposing quarterbacks. The Ram’s Eric Dickerson rushed for a then NFL record 2,105 yards in the 1984 season. The Rams appeared in the 1980 Super Bowl XIV, losing to the Pittsburgh Steelers. The Rams remained close by in Anaheim from 1980-1994. In 1982 the Raiders joined the Rams in LA. The Raiders won the 1984 Super Bowl XVIII as the Los Angeles Raiders. The NFL Network reported that NFL league offices sent letters to all 32 franchises advising teams of the potential timeline for moving a team into Los Angeles. The NFL advised teams to apply for relocation by February 15th, 2013. It’s been rumored that the LA Chargers, the Jacksonville Jaguars, and the St. Louis Rams, among others are in the mix relocate to Los Angeles. The St. Louis Rams are unhappy with their stadium and would consider a move back to Los Angeles. Presumably, the Rams already have a fan base in Los Angeles leftover from the Ram’s long stint in the city. However, bitterness from the Ram’s relocation to St. Louis remains among some fans. Perhaps more importantly, Los Angeles is a notoriously fickle city when it comes to supporting its sports franchises. There are underlying reasons that both the Rams and the Raiders left Los Angeles that go beyond the stadium facility issues. Gaining and keeping fan interest has proven difficult in the past. Hollywood is a unique and formidable competitor that no other sports city must face. The lure of Hollywood attracts a large population from all over the country that is either uninterested in sports or maintains loyalties to other sports teams outside L.A. Additionally, Los Angeles is far from a blue collar town which typically supports sports franchises as in Detroit, Chicago, Cleveland, and Pittsburgh. The L.A. Lakers have a rabid following and are considered by many to be the only game in town. The L.A. Dodgers have a long-standing tradition and have made gains in previous years. USC Trojans. is very popular among southern California sports fans. Competition and general apathy towards sports in L.A. raise attendance concerns for the NFL and potential owners. T.V. blackouts were a problem in the past. Why is the NFL desirous of moving not only one, but potentially two franchises back to Los Angeles? The question is likely answered by the 3.1 billion dollar average annual television rights the league receives annually. That’s more than enough to withstand some poor attendance issues. The NFL is king of the hill when it comes to television. Unlike other sports leagues that are more dependent on attendance for revenues, the NFL makes the majority of its revenue from video. Having a presence in the second largest television market not only makes sense but increase the value of the NFL’s TV package for the next round of negotiations with broadcast networks. Despite the troubled history of Los Angeles football, look for at least one NFL franchise to reappear in L.A. as soon as the 2012 season.